"A well-written, exciting debut thriller that brings together the best elements of a great James Bond plot with commendable depth, suspenseful cliffhangers, emotional roller coaster, and a memorable ending. Highly recommendable!" The Columbia Review. 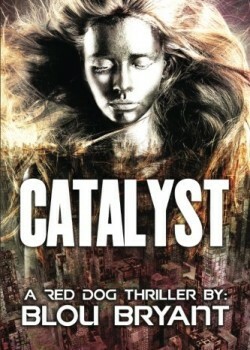 “Catalyst: A Red Dog Thriller” (The Altered series, Volume 1) by Blou Bryant is a futuristic novel set in the ‘not-too-distant’ future. While providing plenty of action and suspense in the best tradition of exciting thrillers, “Catalyst” explores the way humanity might evolve—for better or for worse. Protagonist Wyatt Millar, an almost typical youth at 19, finds himself in a race for his life—and the life of a young girl. The novel provides nail-biting suspense almost from the first page and rarely lets go. The fast pace and intense action, however, never comes at the expense of the novel’s solid character development. Indeed, Author Blou Bryant succeeds in creating a believable, authentic cast of characters in a world that we find wholly plausible as a future product of today’s society. Wyatt is the ultimate anti-hero, a ‘regular’ guy who is drawn into a dramatic situation in which life—his and others—is at great risk. As Wyatt says at one point: “Some nightmares are real. And some dreams, too.” How true! Furthermore, the novel manages to bring up a perfect mix of evildoers, a global threat, a ticking clock and life-and-death choices. It especially excels at constructing an alternate world that’s utterly convincing as a living showcase of what may naturally grow from the roots of our current cultural, economical and behavioral ills. For example, the obsession with appearance, which presently finds outlets in tattooing, body piercing, elective procedures and cosmetic surgeries, evolves into sophisticated DNA manipulations and physical alterations to achieve individuality and physical improvements. “Catalyst” creates a world that readers will find both familiar and fascinating, making it easy to suspend disbelief and enjoy this original story. In summary, “Catalyst” by Blou Bryant is a well-written, exciting debut thriller that brings together the best elements of a great James Bond plot with commendable depth, suspenseful cliffhangers, emotional roller coaster, and a memorable ending. Highly recommendable!